Anyone suffering from diabetes runs the risk of losing their vision. High levels of glucose cause damage to the blood vessels in the retina. This tissue in the posterior part of the eye is fundamental to our vision. It is essential to detect and treat DR to prevent loss of vision. In most patients, high-risk extreme situations can be avoided. In the initial stages, DR can be asymptomatic. Therefore, it is essential to carry out regular and thorough examinations, at least on a yearly basis. This revision must include the following tests: visual acuity test, optical coherence tomography (OCT) and a retinal scan. The results will determine if it is appropriate to carry out other tests, such as a fluorescein angiography. When establishing treatment, laser and microsurgery techniques are very effective. The most common macular oedema is associated with DR, although there are many retinal diseases that can cause macular oedema, such as venous occlusions. It can also occur after cataract surgery. It is caused by loss of liquids (including small amounts of blood) from the blood vessels of the retina, resulting in inflammation of the macula. 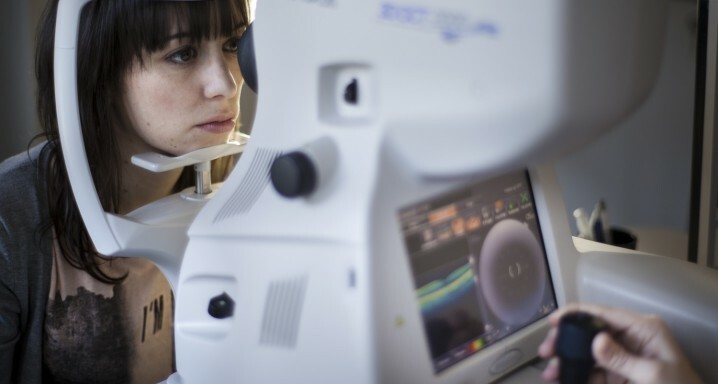 Macular oedema is usually painless, and at first, there are few symptoms (blurred and discoloured vision), but it is necessary to treat it on time. To treat macular oedema eye drops and intravitreal and periocular injections may be applied. Laser or MicroPulse photocoagulation or microsurgery through posterior vitrectomy may be necessary, depending on the seriousness of the case. The Institut uses MicroPulse technology, a therapy carried out using a very low-intensity laser. It is a safe and effective method for the treatment of these diseases, avoiding or, in some cases, delaying the use of intravitreal injections. World Diabetes Day has focused on 2017 on how the disease affects women.